This is really good stuff. 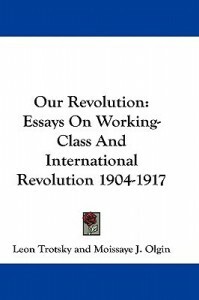 It is a collection of essays on the topic of revolution in general and the Russian revolution in particular. I read the original 1918 edition from the New York Public Library as digitized by Google and downloaded from Archive.org. That means that this was not only written during but also published during the ongoing Russian revolution. The Bolsheviks had just gained power and the civil war was in progress when this edition was published. Trotsky was actively participating and had not yet been made a pariah by Stalin. The book was not history at the time. It was current events. Usually when one reads a book of historical essays like this there are footnotes, forewords, afterwords and other annotations by authors writing at a much later time. This one does not contain that and there are advantages and disadvantages to that. On one hand it is good to have an historical context in which to read it. If one does not have that perspective and tries to read it from the perspective of one's own historical context then it will not make much sense or else it will be misinterpreted. Annotators do tend to provide that historical context. On the other hand, if one does not have the commentary and just reads the current events as current events of nearly a century ago one can form one's own attitude and opinions about it without the immediate influence of the academics. I tend to think the advantage outweighs the disadvantage because if a person does not have any knowledge of the history in which the material was written then one is probably not interested in it anyway and will not be reading the book.